On Saturday, the quarterbacks, tight ends, and wide receivers participated in the NFL Combine. Many players helped improve their draft stock by impressing in the on-field workouts. The quarterbacks got to show off their accuracy and arm strength during the on-field workouts. While the prospects were throwing at the Combine, all eyes were on one quarterback in particular: Dwayne Haskins Jr. from Ohio State University. One thing that scouts and analysts immediately noted for Dwayne Haskins was how quickly the ball zipped out of his hand. He has great arm strength. On top of that, Haskins can make every throw. And he can do it better than every other prospect who threw on Saturday. To start the on-field throwing drills, the quarterbacks threw slant routes. On these slant routes, Haskins showed off his arm strength. As Daniel Jeremiah noted, you can see the ball jump out of his hand. He completed every pass and put the ball in stride and on the money on every throw during the slants. During the curl-routes and out-routes drills, Haskins impressed. Dwayne showed great timing anticipation during these drills. His accuracy in the intermediate range was a strength in college, and that seemed no different at the combine. Dwayne Haskins showed off his deep accuracy on the corner routes. The prospects were struggling with this throw before Haskins took a crack at it. Kurt Warner even said the prospects were completing about 10% of the throws. But once Dwayne Haskins stepped up to throw, that changed. He put every throw right on the money. He had great height on his passes and tremendous accuracy, touch, to go along with perfect timing. Giants fans everywhere will agree with Daniel Jeremiah: Giants’ super star wide receiver Odell Beckham Jr. could have corralled the second pass by Haskins. Engram, too. 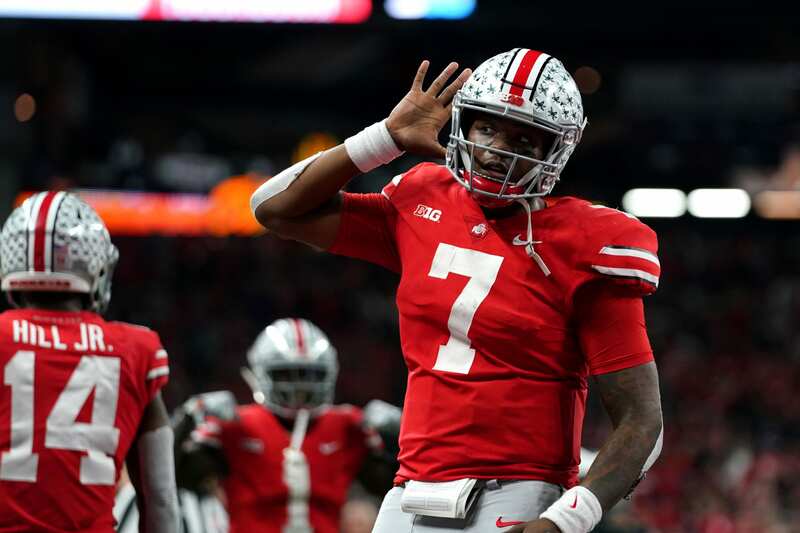 Dwayne Haskins could be the future of the Giants’ franchise come April. The Giants seem to like him. New York Giants’ offensive coordinator Mike Shula payed extra attention to Dwayne Haskins on Saturday. The team met with Dwayne on Friday night, then continued to scout him on Saturday. According to Pat Leonard of the New York Daily News, Shula spent a lot of time chatting with Haskins on the sideline. Haskins was officially weighed and measured on Friday. He stood tall at 6 foot 3 and three eighths and weighed 231 pounds. It is safe to say Haskins is a big guy. Unfortunately for Dwayne Haskins, he is not a fast big guy. He ran a 5.04 40 yard dash at the Combine. He was the slowest quarterback in his group.
.@OhioStateFB QB Dwayne Haskins runs a 5.04u 40-yard dash in his first attempt. A good thing for Dwayne Haskins is that he is more of a thrower than a runner. His slow 40 time will not affect his draft stock at all because it is not important. Haskins will never be asked to run 40 yards straight down the field. He is a strong-armed accurate passer. He plays his best when he has time in the pocket and can scan the field. Dwayne Haskins is an accurate, pro-style quarterback. 2019 nfl draftDaniel JeremiahDwayne HaskinsDwayne Haskins Jr.Evan EngramKurt WarnerMike ShulaNew York GiantsNFL CombineNFL Draft 2019Odell Beckham Jr.